Leaver Penalty Now Taken Out of Apex Legends. Confirms League Play? The most recent Apex Legends patch update came with typical bug fixes and modification of Legend’s abilities. 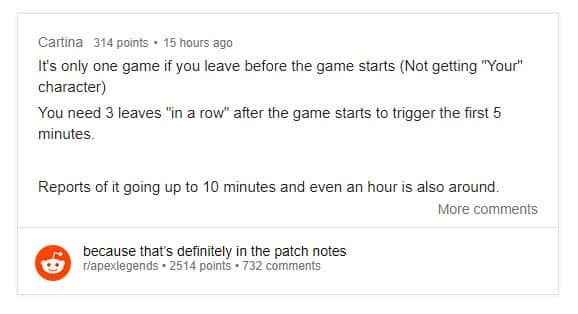 But one addition, which wasn’t included in the patch notes was the “Leaver Penalty”. Respawn has now removed it, blaming “missing script” for it’s release. The recent Apex Legends patch notes included typical touch-ups such as quality of life, bug fixes, and fixing Octane’s Jump pad issue with regards to using “Into the Void ability”. 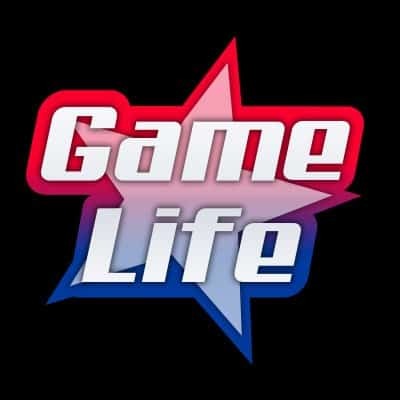 However, many players were pointing out that there was a new feature called the “Leaver Penalty” that would penalize players who left games early. There were no official announcement from Respawn Entertainment. But one user quickly took a snap shot of the feature and posted it on Reddit. If users got anything out of this leak, it’s that Respawn Entertainment is trying to solve a major underlying issue. Players who quit the game early. This issue plagues every multiplayer game, and companies have tried different methods to keep players from leaving in-game. Call of Duty games had a variety of different methods such as prolonged departure (not a simple select + quit), loosing XP points, etc… It seems now Respawn will be taking it a step further and not allowing players to join back games immediately, penalizing them for roughly 5 minutes from the first offense, and going up to 10 minutes after multiple offenses. 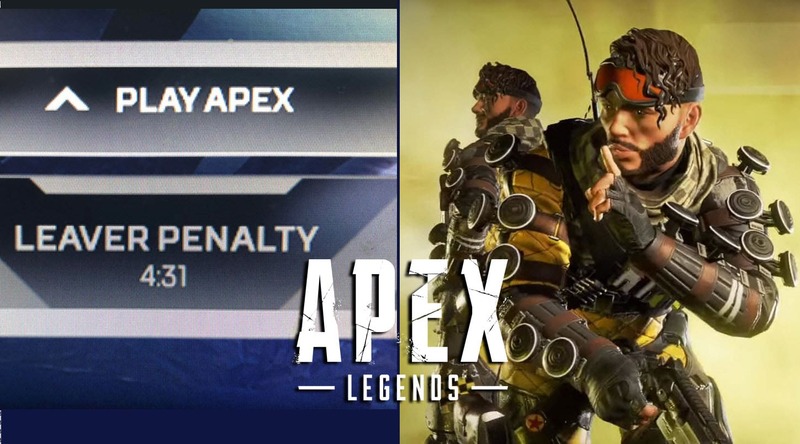 Although this solves a major issue with the game, will some players stop playing Apex Legends altogether if this Leaver Penalty does role out? It’s not secret that Apex Legends popularity has lost momentum. Given that the game is below the top 5 most watched games on Twitch, hanging around 30k viewers at any point in time. This is a significant drop from it’s regular 200k+ viewership back in February and early March. Leaver Penalty Leak Confirms League Play? On Apex Legends leaker posted on their twitter page that the odds of League play coming to Apex Legends has increased. They stated that one of the League Play leaks was a ‘Penalty Leave’ feature. So if we have seen an actual feature from the leaked “League Play” code snipit from last month, does this confirm that League play will actually be heading to Apex Legends? The Call of Duty franchise just released their league play a few months back, and Fortnite has their new “ranked play”. So it would only make sense that Apex Legends would have something along the lines of those two in-game.